Home » The shields of the Gauls. Clans in the Roman Empire. The shield of the Gauls, according to Strabo and Virgil, was usually long, and the Ligurians carried one of the same form. In sculpture, we perceive the Germans with an oval shaped buckler of ample dimensions. Tacitus admits it was large, but suited to the size of the bearer. From the plates in Cluverius’s work, we find it was at first formed of the rough wood, or bark of a tree, sometimes retaining the natural curve, but at other times appearing flat,and nearly the length of the body; in several instances it appears formed of straw, or rushes, something resembling the work of bee-hives. A small round shield seems, however, to have been the favorite of the Celts; and Schoepflin notices the remains of some discovered in Germany. Several of the Celtiberi used the light shield of the Gauls, and others bore round targets, the size of bucklers; but, at Cannae, Polybius says they both carried the same kind, which he describes as weak. The Roman shield was, at first, square; but in their wars with the Tyrhenians, a people of Gallic origin, they adopted the round form used by that people. From the spoils that were taken at Thermopylae, where the Gauls had no other weapons of defense, and deposited in the temple of Apollo at Delphos, Pausanias describes them as similar to the wicker targets of the Persians, called Gerrha. Those Celts called them thureoi, or thyreos; the Welsh still use tarian, and the French retain thiros. In the Gaelic, tearmun, protection, or defense, is appbed to a shield, as well as targaid, from whence comes the Saxon targa and English target; but sgiath is the usual term, and is applied to a buckler from its supposed resemblance to a wing, denoted by the same word. The most ancient and most common shields of the Caledonians were, probably, made of interwoven twigs covered with hide. In the poem of Cathula, a sword is said to pass through the folds of a shield; and young Oscar, in Duthona, is represented with one formed of woven reeds. Caesar describes the Aduatici, who occupied the country about Douay, as having targets of wicker, covered with a tough hide; and Tacitus says those of the Germans were either a sort of basket work, or of board, painted, but seldom bound either with leather or iron, like that of the Romans. The Scots of Ulster, in the time of Spenser, carried long wicker shields, which were quite unknown among the Southern tribes. Lucan says some of the Celtiberi used a small shield, called Cetra, which the Romans afterwards adopted. I find that Cetra, in Gaelic, means something intervening, a term very applicable to a shield. The Lusitani carried shields of a peculiar form, resembling a half moon, and composed of the sinews of animals, so strongly interwoven, that, for lightness and strength, they could not be excelled; being, besides,managed with admirable skill, and whirled about so dexterously that it was scarcely possible to wound the person who bore them. They were called Peltae, and four are represented on the shield of the Vesontes in the engraving. Among the Etruscans it was round, and not fixed to the arm, but held in the centre by the hand. The shield of the ancient Caledonians, according to Herodian, was oblong, resembling those assigned by Cluverius to the continental Celts; but numerous discoveries prove that this was not the only form, if it was at all common. Dr. Meyrick, indeed, exhibited lately to the Society of Antiquaries, a curious remain of a shield of this shape, but the original British target was circular. The figure of Britannia on Roman coins is represented with one of this form, and apparently of the dimensions of those which the Highlanders, during their independence, continued to use. The bards invariably speak of them as round, and they appear to have generally resembled those used in the last century, the poetical expressions “dark brown,” “shield of thongs,” alluding to their covering of leather. The targaid of the Scots’ Highlanders was always orbicular, and formed of one or two thin pieces of wood, covered with one or more folds of thick leather, fastened by numerous nails, usually of brass, but often of iron, and sometimes of silver, according to the circumstances of the party. the hand; and, in numerous cases, those parts have been discovered of iron and brass, when the wooden shield has been long perished. This method of wielding the shield was common to all Northern nations. The small round target, covered with leather, common to both Scots and Irish, was always retained by the Highlanders, who signalized themselves by its adroit management. So early as the first century, their ancestors excited admiration by the dexterity with which they used it in eluding the missiles of the Roman army. The single hold, by which the targe was grasped, enabled the bearer to use it with advantage;and of so much importance was it deemed, that, in the last unfortunate rebellion, it was the first care, after the battle of Preston Pans, to provide a large supply for the army. By receiving the points of the bayonets on their targets, they were able with their swords to assail the enemy, who, by this mode of attack, were almost defense less. Nor was this all: the shield had often a spike fixed in the centre; and they were accustomed to carry the dirk along with it, and thus were doubly armed. “When within reach of the enemies bayonets, bending their left knee, they, by their attitude, cover their bodies with their targets, that receive the thrusts of the bayonets, which they contrive to parry, while, at the same time, they raise their sword arm and strike their adversary. Having once got within the bayonets, the fate of the battle is decided in an instant, and the carnage follows; the Highlanders bringing down two men at a time, one with their dirk in the left hand, and another with the sword.” These are the words of one who served in the campaign, and was well qualified to give an opinion. This superiority in tactics engaged considerable attention at the time of the rebellion, and various plans were suggested to enable the regular troops to resist the furious onset of the Highlanders. The shield of the Celtic chiefs was frequently of metal, or, like the above, was covered with it. An iron shield, round, and weighing nearly twenty pounds, is mentioned by Pennant as preserved at Dunvegan Castle, in Sky. That of the Earl of Mar, in the engraving, is of steel, ornamented with gold. The shield was sometimes raised in bosses, called, in Gaelic, copan, which, from being hollow, could be made to emit a sound, and, by means of these, it served other uses of some importance among the ancient Caledonians. It was either suspended on a tree, or between spears, near the king or commander of an army; and, when at sea, it hung on the mast, “the dismal sign of war,” and being struck with a spear, was a signal for assembling the army, or preparing for immediate battle. Hence it was poetically named “the shield of alarms,” “the warning boss,” &c.
The Celts did every thing in a grave, solemn, and peculiar way. It seems to have been a privilege or duty of the leader of the war “to strike his shield at times,” and the warriors appear to have done so occasionally, “when their rage arose,” either to keep alive their ardor, or as an indication of their readiness and anxiety for the contest. It was also the practice, at least during the war, of awakening the chiefs by these means. I cannot, however, very well conceive how the sound emitted could be sufficiently loud to be heard through the whole army, as the expressions of the poets seem to imply, although they had been formed of the most sonorous materials; and such a mode of directing the military operations of the troops appears unnecessary, where there were horns for the express purpose. A people that were able to fabricate the other ingenious parts of their military accoutrements, could certainly form a shield of iron capable of producing a certain tone; but the extraordinary effect that is said to have attended the loud clang of these bucklers, can only be set down as a poetical embellishment. The shield of Cathmor, a chief of Ireland, as described in the seventh book of Temora, seems too artificial to be reconciled, with satisfaction, to the rude state of the arts at that time. It had seven bosses, each of which was ornamented with a star, representing a constellation, (The shield of Achilles was, likewise, ornamented with celestial signs) and conveyed by its sound a particular order from the king. I should certainly be inclined to doubt the existence of such a singular article, did we not know, from discoveries, that the bosses were sometimes of silver, or other metal, of very ingenious workmanship,and were it not possible to attempt a rational explanation of this traditional account. 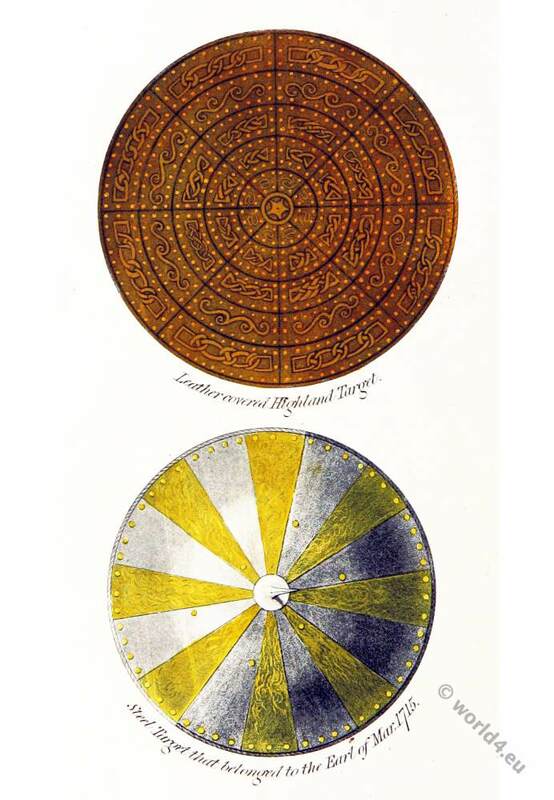 Shields of metal were certainly of limited use among those tribes, and were confined to the chief men, giving rise to the expression of “blue-shielded kings,” &c. That of Fingal was evidently of this sort; and the following passage will throw considerable light on the manner in which this curious custom was observed. “On two spears hung his shield on high; the gleaming sign of death: that shield which he was wont to strike, by night, before he rushed to war. It was then his warriors knew when the king was to lead in strife; for, never was this buckler heard, till the wrath of Fingal arose.” This shield, formed of metal, or covered with a plate of iron, was of a more simple construction than that of Cathmor. The term “bossy,” applied to these bucklers, was expressive of the little convex plates with which they were ornamented. Some were, no doubt, fabricated with superior ingenuity, divided into several of these bosses, or knobs,a blow on any one of which might have been the method by which the commands of the General were conveyed to the army. This is perfectly agreeable to the symbolical and figurative manners of the Celtic race, and the method was less strange than at first appears. The seven bosses on Cathmor`s shield were “the seven voices of the king, which his warriors received from the wind, and marked over all their tribes.” Here we are not told that the sound of the particular boss which he struck was so loud as to be heard by all the army, but the different clans were informed by means of the warriors. In the former extract we also find that it was the warriors, i. e. the usual, or those above the commons, only, who knew when the engagement was to commence. It maybe further observed, that the King of Morven, on one occasion, having struck his shield in the night, many of his host were awakened, and thought it was a signal for them to get under arms, which, from other passages, we are led to believe it must have been; but receiving no further intimation, they again went to sleep. It is impossible to believe that these shields could have sounded so loud as the Bard, by poetical license, has given us to understand; and if the bosses of Cathmor`s had rung with the noise of tenor bells, the army would, nevertheless, have been liable to misunderstand their import: but the king’s determination being indicated by his giving a certain number of knocks on a particular boss, his warriors or attendants instantly retired and conveyed his orders to their respective clans. The shield was the only part of the warrior’s armour appropriate for the purpose of announcing the resolutions of the chief; and, as that of Cathmor was different from Fingal’s, perhaps each tribe had their peculiar signals. The king is defender of his people, and the shield, used as the defence of the body, denoted his presence, by being always suspended beside him. It was also used figuratively, to denote this office of defender,in being carried by bards in front of the army after a victory, as we find from a Gaelic poem which refers to the era of the Caledonian Bard. Those who besought assistance, also presented a shield covered with blood, to denote the death of their friends or defenders. The use of the shield as a tablet, whereon the glory and renown of heroes and their ancestors were set forth, is not its most ancient appropriation. The origin of coat armour is, more probably, to be traced from the practice of displaying the intentions or determination of hostile parties. If the ancient warriors wore the skins and other parts of the animals they killed, or adorned themselves with the spoils of their vanquished enemies, they did so to inspire terror, by this means of shewing no less their power and valour than their inclination to support their prowess. 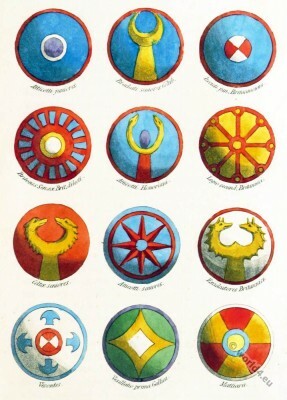 Nations and individuals have frequently assumed certain symbols and borne them on their shields or ensigns, to demonstrate to others the designs on which they were engaged. The very meaning of the word herald signifies the champion of an army; and to declare war is still his province. The Bards were the heralds of the Celtæ, and they carried the shields of the chiefs, as the herald of succeed in gages bore the arms of his country or patron. The marks impressed on the leather covered targaid (Target) resembles the intertwining of sprigs, a favorite ornament among the Celts, being imitated in the hilts of the dirks, and introduced in their brooches and other ornaments. This intricate tracery, which formed, for so many ages, their common pattern, is seen in the rude sculptures of monumental stones, and appears to be derived from the mysterious woven knots of the branches of trees, under which the Druids concealed their knowledge, and of which more shall be said hereafter. The Gauls, says Diodorus, had often the brazen figures of animals on their shields, which served both for ornament and strength; those of the Cimbri being bright and glittering, adorned with the figures of beasts. The Celts were also fond of painting their shields, a practice which they had in most ancient times, and which, being adopted for the purpose of distinction, is clearly the origin of the science of heraldry, about which its professors and antiquaries are so ill agreed. At Thermopylae, the Gauls had their shields painted in a certain manner; and the night being so dark as to prevent them from perceiving the figures, they were unable to recognize their own troops, and consequently fell into complete confusion. When society is rude and unsettled,it is not to be expected that individuals will have distinctive symbols or marks; a whole tribe adopts a general recognizance: but the origin of coat armouris to be traced to a much more remote period than the era of justs and tournaments. Dr. Henry very ingeniously supposes that the introduction of clothing led to the transfer of the figures which characterized nobility, from the body to the shield. This is, probably, in some degree true, for the skin was stained for a mark of distinction; but insignia, I apprehend, were first exhibited on standards and shields; and it is probable that the practice was, at first, connected with a religious feeling, the figures being, perhaps, the symbols of gods. In proof of this, we find that the Aestii carried the images of boars, to indicate the worship of the mother of the gods; and by this mark they were recognized and protected among their enemies. The Gauls carried the images from their sacred groves to battle. The princes of Milan, on Hannibal’s descent into Italy, took the ensigns of gold from the temple of Minerva, which ensigns they called immoveable, and marched with them against the Romans.’ That people did themselves retain something of this ancient custom; the eagles and other military ensigns being deposited in a sacellum with the tutelar gods, and, when displayed, they were placed together in the same rank. The materials of these banners it is not easy to discover. In the poem of “the Death of Fraoich,” conjectured to be of almost equal antiquity with Ossian,— bratach sroil, a silken flag, is mentioned, but it is doubtful whether this be not an interpolation. It is probable that the term now applied to silk, formerly meant only something of a very fine texture. The colors of the ancient banners, or their devices, are not distinctly known. “The dark wreaths of Erin’s standard,” (Dargo) the blended colors of Mac Druivel`s bratach, the beauteous green colored banner of the King of plains,” and the red and green meteors, as others are termed, do not give a very definite idea of their appearance. The banner of Gaul, a companion of Fingal, was called Briachail bhrocaill. The Celts did not confine their distinguishing badges to their flags; they had, we have seen, long before the commencement of the era of Christianity, depicted them on their shields. The Germans are celebrated for the taste with which these were painted, the various colors being much admired. Tacitus speaks of the Arians, one of their tribes, as having been distinguished by black shields, but he describes them generally as ornamenting them with figures of animals, bears, bulls, wolves, deer, oxen, horses, dogs, and lynxes, being enumerated. The accompanying print, engraved and colored from the descriptions in the “Notitia Imperii” of Pancirollus, and the “Hieroglyphica” of Pierius, will shew that the Gallic and German auxiliary troops bore various devices on their shields, which were certainly, to all intents and purposes, coat armor; and in a tasteful arrangement of colors and design the British legions did not yield to their continental friends. In the compositions of the bards we often find allusion made to painted targets. Sometimes they are called red, at other times spotted, varied, or chequered. Some of the figures depicted on the Celtic shields bear a close resemblance to those in modern coat armor. We recognize the star, the gyron, the carbuncle, the lozenge, the crescent, the griffin, the pall, the tressure, &c. that appear in forms as rude as in many old works on heraldry. From the book: “The Scottish Gaël; or, Celtic Manners, as preserved among the Highlanders: being an historical and descriptive account of the inhabitants, antiquities and national peculiarities of Scotland; more particularly of the Northern or Gaelic parts, etc” by James Logan.